Do you get ideas or visions from the Lord, about a dance to a song, but get kind of stuck with what to do next? Do you need to choreograph a dance or presentation for a holiday or event and don’t know where to start? Are you an experienced choreographer and need some ideas and concepts to enhance your knowledge? 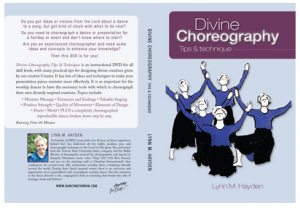 Divine Choreography Tips & Techniques is an instructional DVD, for all skill levels, with many practical tips for designing divine creations given by our creative Creator. It has lots of ideas and techniques to make your presentation pieces minister most effectively. After Lynn talks about and describes each technique, it is then visually demonstrated with a group for visual re-emphasis. 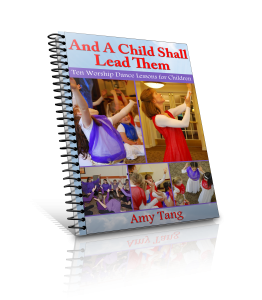 Ministry Message – Entrances and Endings – Valuable Staging-Position Strength – Quality of Movement – Elements of Design – Duets – Motif – PLUS a completely choreographed reproducible dance, broken down step by step.